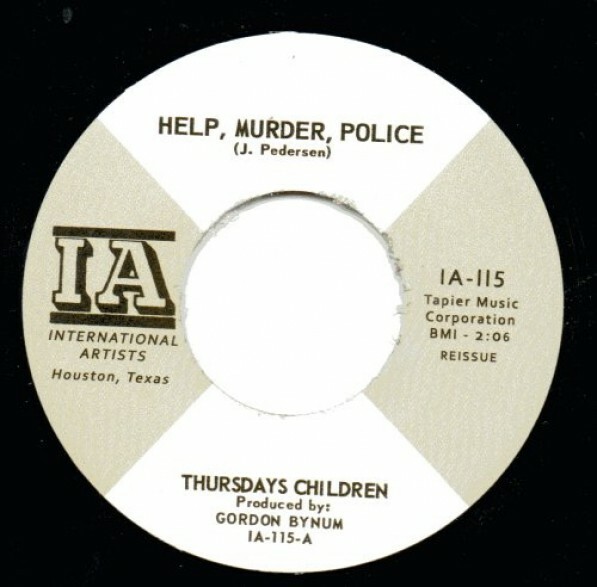 THURSDAYS CHILDREN "HELP, MURDER, POLICE/You Can Forget About That" 7"
great '67 TX garage punk/pop. Repro 45. OUTCASTS "I'M IN PITTSBURGH & IT'S RAINING/Route 66" 7"
Kempy And The Guardians "Love For A Price/ Love For A Price (slow version) 7"
FALLEN ANGELS "BAD WOMAN"/RIC GARY "Pimples & Braces" 7"
ESQUIRES "COME ON, COME ON/JUDGEMENT DAY" 7"
SYNDICATE "THE EGYPTIAN THING/SHE HAUNTS YOU" 7"
TAMRONS "Wild-Man / Stop, Look, Listen" 7"